The 6th year student course about Values of ecosystem services, biodiversity and green-blue infrastructure in cities focuses on exemplary parts of the city of Decin – Marianska louka, Kvadrberk – at this time. Course took place on the second week of October at Jan Evangelista Purkyne University in Usti nad Labem (UJEP). 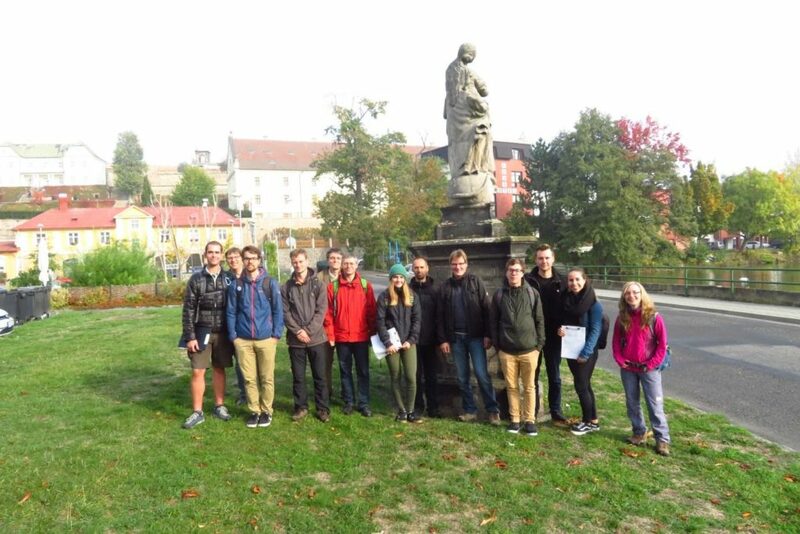 The IEEP with Liebniz Institute of Ecological Urban and Regional Developmnet organise this bilateral course for Czech and German student. This 3-day course allows participants to test methods of mapping green-blue infrastructure. The goal of this mapping is to evaluate ecosystem services of selected locations. Ecosystem services are the direct and indirect contributions of ecosystems to human well-being. Each Czech-German group of students will work on a joint project over the next few months. They will use the acquired methods to evaluate green-blue areas in Decin. Interim results will be presented in November 2018 at Dresden meeting in IÖR (Dresden). 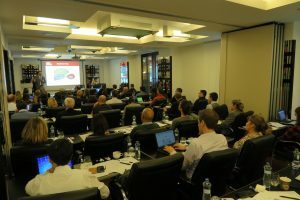 The course is organised as a part of BIDELIN project. Looking forward to a second meeting! We invite you to an international conference Energy efficiency policies toward 2030 – opportunities and challenges for Central Europe, which we hold in cooperation with the Czech Technical University in Prague and the Czech-Austrian Energy Expert Group. The conference will take place on 26 November 2018 in How2Base Hall in the city centre of Prague (address: Římská 20, Prague 2). Capacity of the conference is limited! Please confirm your attendance until 15th November 2018 by e-mail to: precechtel@e-academia.eu. Follow us on 20th June for the IWRA webinar: How land matters for flood risk management? Wednesday, 20. 6. from 13:00 (CET), there will be 60-minute broadcasting from the Riga workshop focused on land and flood risk management issues (more about COST action LAND4FLOOD here). Webinar is organized under the supervison of the International Water Resources Association (IWRA). Lenka Slavíková, executive director of IEEP, is one of the panelist. More about webinar here. Special Issue of JFRM has been published! The special issue of the Journal of Flood Risk Management 1/2018 Land for Flood Risk Management: A catchment-wide and multi-level perspective has been published. Jiřina Jílková served as its co-editor. Together with Jan Macháč and Lenka Slavíkova, two papers co-authored by IEEP members are included in the special issue. 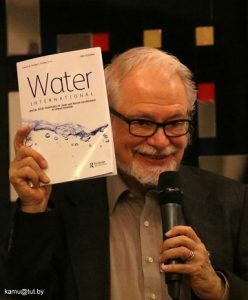 Impact Factor of the journal is 3.121 (being in Q1 of Water Resources). In January – February 2018, the winter part of the bilateral Czech-Austrian course Energy & Society was organized in Prague in cooperation with Czech Technical University and University of Economics. The 13th year was inspired with the interactive form of teaching using experimental desing and discussions. 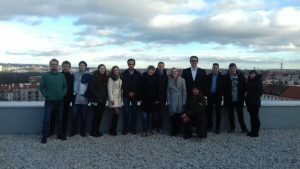 Students visited small water power plant in Mirejovice and the coal power plant in Melnik. 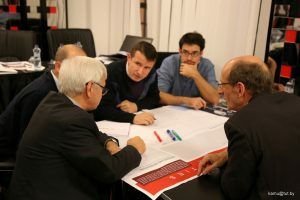 The second part of the course will be held during summer in Vienna. In the meantime, bilateral Czech-Austrian teams develop common theses and looking forward to their second meeting. Together with the Department of Regional Development and Public Administration and the Department of Geography, the IEEP organizes the international conference Social And Economic Development & Regional Policy: Adaptation Of Post-Industrial Society To Global Changes. The conference is under the supervission of the Regional Studies Association. Conference dates: 27th – 28th June 2018. Abstract submission until: 31st March 2018. More info: here. On 9 – 10th November 2017, IEEP organized first large MC meeting of the COST Action LAND4FLOOD. There were participants from 28 European countries, having prof. James Nickum from IWRA as a special guest. One of the meeting goals was the development of a Policy Brief with the key topic of the project (why land matters for the flood risk management). From October 2017, the IEEP investigates methods for the economic evaluation of green and blue infrastructure in urban areas. Read more about the project here. The IEEP work has been notices by the local “UJEP stories” portal (article only in Czech).